Peanuts and peanut butter are among the most popular foods in America, according to the American Peanut Council. Aside from being a versatile and widely enjoyed food, peanuts are also a source of nutrition because they contain large amounts of protein, essential nutrients, dietary fiber and other important vitamins that your body needs. Some dieters may be concerned about the amount of cholesterol that peanuts may contain, but you needn't worry -- peanuts are cholesterol-free. Cholesterol is only found in animal-based foods so peanuts, being a plant-based food, contain no cholesterol. They do however contain beneficial fiber, niacin, protein, folic acid, magnesium, potassium, vitamin B1, vitamin B2, vitamin E and phytosterols, according to the Linus Pauling Institute, making them a popular addition to a health-centered diet. However, they also contain a relatively large amount of calories and unsaturated fat, so it is advisable to eat them in moderation. Numerous clinical trials have shown that regularly including nuts in your diet has clear health benefits. For instance, healthy men who had already suffered a heart attack were able to reduce their risk of cardiovascular disease by regular consumption of nuts, Harvard Medical School says. Health experts think that this is due to the high unsaturated fat content in nuts, which are known to improve heart health and lower “bad cholesterol” in the blood. Since nuts also contain a lot of protein, they can be used to replace less healthy protein sources in the diet. The high amounts of fiber and vitamin E also have a beneficial effect on cardiovascular health. 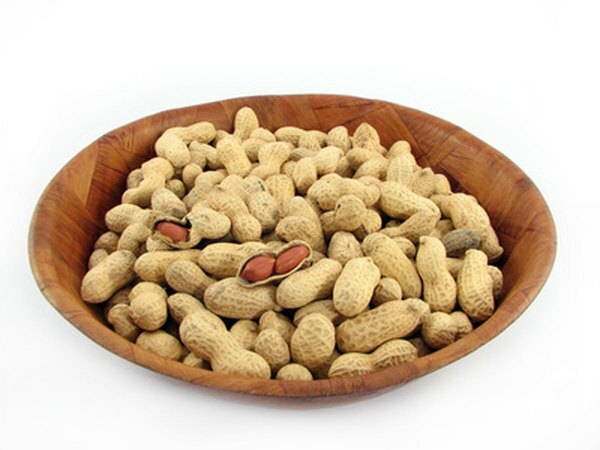 Peanuts also are a prime source of phytosterols, which have been associated with reductions in heart disease risk and cancer cell growth rates, the Linus Pauling Institute says. It may be tempting to help yourself to a heaping bowl of peanuts, but in truth you don’t need that much. Peanuts contain high amounts of fat, and even though this fat is healthy, it still counts as extra calories that your body probably won’t burn. Try to eat around a handful of nuts every day. But don’t forget to incorporate this into a healthy regimen of proper diet and exercise if you want to see effects. Avoid, chocolate-covered, oil-roasted and salted peanuts -- they might contain saturated fat that negatively affects your blood cholesterol levels. Choose unsalted and dry roasted peanuts instead. When storing peanuts, put them in the freezer, not the cupboard, to prevent them from turning rancid. Peanut butter has the same nutritional content as whole peanuts, but inspect the brand and ingredient list when buying. Many manufacturers add large amounts of sodium and sugar, which negates many of the health benefits. Peanut butter brands that have partially hydrogenated fats among their ingredients contain unhealthy trans fats that increase the risk of cardiovascular diseases and boost your blood cholesterol.